Designing a timeless object is difficult in today's culture of disposable tech, though you think people would've figured out by now that you just need to stop putting clocks on everything. 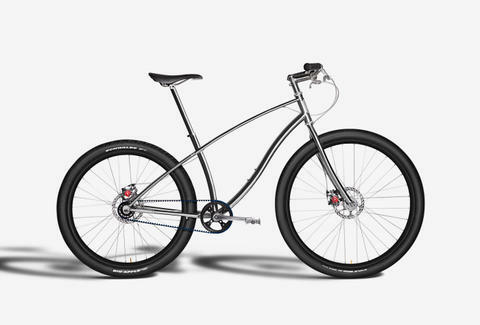 Building modern bikes that'll still be beautiful in the future: Budnitz Bicycles. The baby of the dude who founded the vinyl toy empire Kidrobot, Budnitz applies future-forward urban design towards creating aesthetically sleek, minimally logo'd, pedal-powered titanium city bikes meant to withstand the test of time and deliver a product that's "functional, lightweight, incredibly robust, and strong", so Brandon Roy, except robust, and functional. Budnitz currently produces two frames with simple, sweeping lines: the No. 1 rocks an aggressive geometry and stiff frame that -- when paired with narrow tires -- is meant to be comfortable and quick on longer trips, while the No. 2 is a smooth-riding "BMX for adults" made for grocery store jaunts, with fat tires and a relaxed sitting position, which is exactly how you should enjoy a No. 2. Both bikes offer sweet features like shifter and brake cables concealed inside the frame, as well as a Gates CTX carbon fiber belt drive in single speed or hooked up to an 11-speed Shimano internal hub, plus options like alloy fenders and even a brass bell, which'll require brass balls to ring in public. Because every bike’s built by hand, an order will get you in line for the next shipment, which'll likely sell out fast. You can also wait for the third model, another awesome city number currently in development. How awesome? Only time will tell, and luckily, you've got a clock on everything you own.